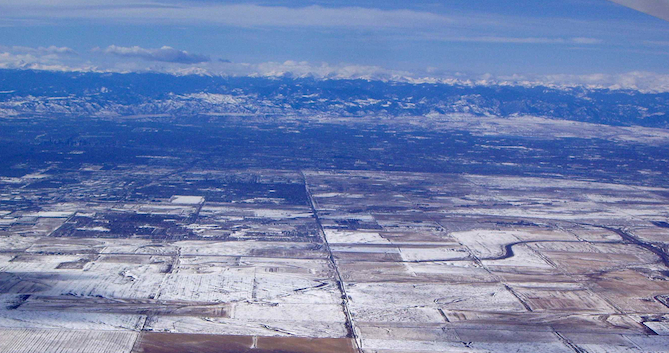 Denver from the air a comparative discussion of density and sizes. Denver, Colorado on a winter's day. At one mile above sea level in an arid region, Denver, the twentieth largest metropolitan area in the country, boasts that it has the nation's most highly educated population. Metropolitan sprawl uses up more than space; both water and electricity are needed for urban life. Because water and energy are needed to inhabit modern urban areas, David Pimentel has argued that it takes ten calories of energy, or the equivalent of oil to bring one calorie of food to the modern urbanite's table. Denver's households are 47% occupied by people or families who rent & the median age was just over 33 years old. One in three people are between 25 and 35 years old there. Denver County is a consolidated city/county; so the population in 2012: 634,265 was the same as the city which in 2000 was 554,636 persons. Nearly four in every five people in the nation live in urban settings and a plurality live in suburban areas that are dependent upon the urban core. 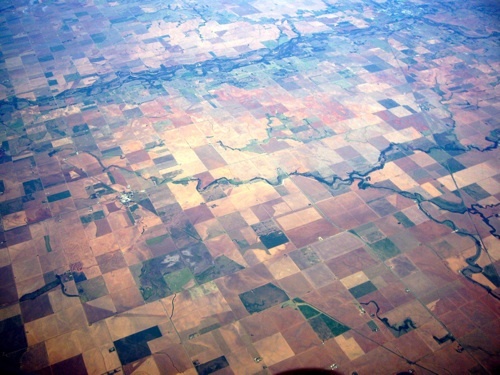 Notice the grid pattern above that reveals the agricultural use of this land (as depicted below) before the 1950s. More on impact and ghost acres. The list of most sprawling metropolitan areas. "While Denver still remains a relatively low density city that relies heavily on the automobile and highway transportation, there has nevertheless been a clear change in regional policy that is encouraging more transit and higher-density transit-oriented development and that change in policy is having a recognizable impact on Denver’s land use and urban form." There are a wide range of density figures for cities such as Denver [4,000 to 16,000], for example Phoenix ranges from an average of over 3,000 to nearly 9,000 people per square mile depending on the region. see - Zip-Code Atlas compared to Business Journal article.